Davit Narmania was born on March 7 of 1979 in Zugdidi. In 2000 he graduated from Tbilisi State University, faculty of management and microeconomics. The specialization in organization of foreign economy and governing. In 2000 he was granted Bachelor’s degree in economy. In 2002 he was granted the Master’s Degree in economy with the qualification of international business manager. In 2006 after finishing post-graduate studentship, he was granted the degree of Academic doctor. He has undergone trainings in university of Potsdam, Germany. He is the owner of scholarship of George Shultz and other awards. From October 2012 till April of 14 he was the minister of Regional Development and Infrastructure. 2008–2009 - the chief of research department in "Consultative Analytical Training Center"
At different times he was Georgian Young Economist’s Association’s chairman and deputy chairman of the board. At different times was an expert in different international organizations, including American Development Institute and World Bank. He is the author of 24 and co-author of 34 popular scientific works. 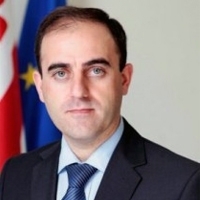 Narmania is the full professor at Tbilisi State University. Speaks Georgian, Russian, English and German. Is married with two sons.